A Style SR in GTA Chinatown Wars. 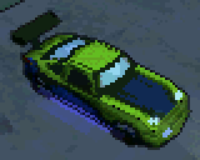 The Style SR is a sports car which appears in Grand Theft Auto: Chinatown Wars. The Style SR is designed as a two-door sports car-based "tuner", distinguished by its green-and-blue body color, as well as a large spoiler and purple neon underglows that light up at night. The car appears to share a similar body design as the 500 XLR8 and the Comet (the 500 XLR8 suggestively based on the Comet), but is slightly longer. The car, like other tuner cars, also backfires at the exhaust pipe. The Style SR's performance is a considerably good, possessing excellent acceleration and top speed, and a moderately good steering, while the car's brakes are only responsive at lower speeds as it results in the car having a longer stopping distance at higher speeds; the car also has the tendency to lean towards the side when steering around tight corners. Its durability is, as expected, low. The Style SR can only be purchased at the BOABO Auto Merchant after attain a minimum of bronze medals in all Bohan races. This page was last modified on 19 September 2010, at 08:25.